We’ve been thinking about the things that make meerkats special, and their distinctive moves—scurrying to burrows or acting as sentinels—really stand out. And now, we honor those moves with some dance moves of our own! 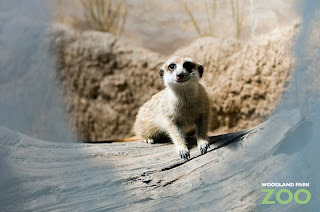 Show us how you “Do the Meerkute.” Download the free mp3 (recognize that voice? It’s The Presidents of the United States of America’s Chris Ballew!) and make your own dance video. Then submit it as a video response to our YouTube video. Full instructions are available on our website. 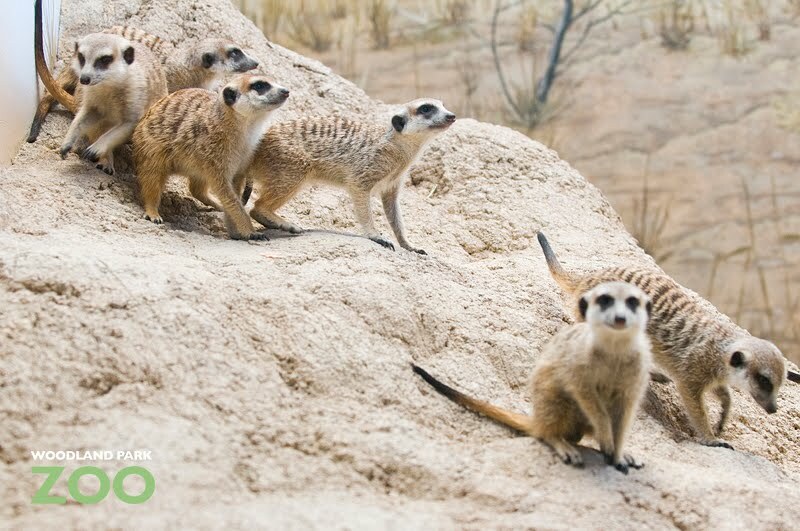 Of course, the meerkats are more than just cute—and we encourage you to come see them for yourself and learn all about their social structure and amazing adaptations. Don’t miss their debut on May 1 with opening day festivities including live music, meerkat-themed giveaways, keeper talks, crafts and more. We hope to see you there! Producer: WONGDOODY, Seattle; Composer: Eric Englehorn; Vocals: Chris Ballew; Sound Design: Clatter & Din; Sound Engineer: John Buroker. 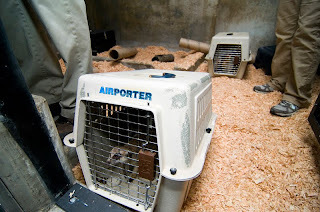 This week all eight meerkats were given access to one of the two rooms in their exhibit. In preparation, keepers coated the guest viewing window with wax. This is typically done so that animals see that there is a barrier there and don't run into it. After we let these little guys out they explored the entire exhibit from top to bottom. When they finally found the window they actually seemed annoyed that they couldn't see out! So we cleaned off a small section about 8 inches in diameter. All eight tried to peek through the small opening so we had to make it bigger. While we cleaned off the wax with a towel, one of the meerkats stood on the other side of the glass and seemed mesmerized by the circular motions of the towel. It was really cute to watch! At this point we decided to remove most of the wax to allow them to watch some of the last minute preparations taking place outside their exhibit. 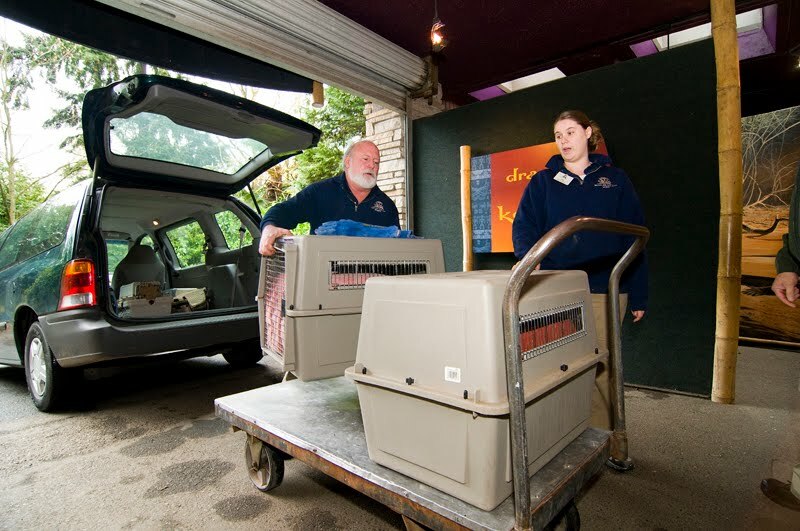 Later this week we will introduce the group to zoo staff to observe how they are going to react to crowds, like the ones we hope to get this summer. If the window cleaning encounter was any indication, they are going to be just fine. It’s National Volunteer Week this April 18 through 24, and we want to take a moment to thank our phenomenal 762 volunteers who give of their time, talents and devotion to animals and nature. Their dedication, whether it's helping to dice vegetables for gorillas, assist keepers with cleaning or the horticulture staff with our botanical collection, helping at public events, educating the public or providing office support, and the myriad of other tasks, helps us promote our mission of saving wildlife and habitat. Join us in thanking these incredible members of our community! And here's some exciting news--this chick now has a sibling, hatched on Easter Sunday! 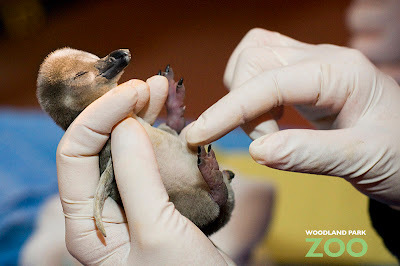 Penguin keepers are weighing the chicks each day for the first week after hatching to ensure acceptable weight gains while allowing the parents to raise their chicks and gain experience as parents. In zoos and in the wild, both penguin parents take turns incubating the eggs and caring for their young. It will be early summer before the penguin chicks emerge from the nesting burrows and venture outdoors into the public exhibit. We'll post updates periodically as the chicks grow. 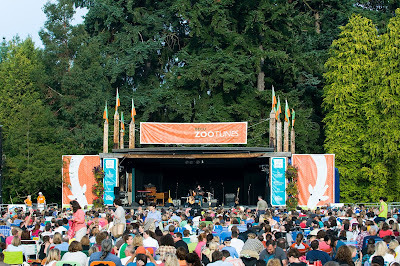 Video produced by Ryan Hawk, narration by Katie Norton/Woodland Park Zoo. 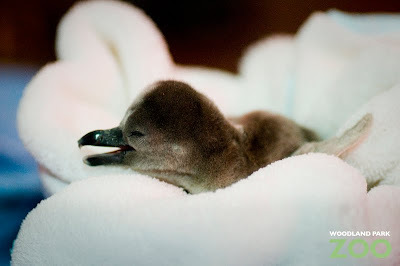 As we shared earlier this week, Easter has delivered an early batch of eggs to Woodland Park Zoo – Humboldt penguin eggs, that is – and the first chick was discovered to have hatched on April Fool’s Day! The first penguin chick represents the first offspring for mother Dora and father PJ, both 3 years old. The second egg in their nest shows pipping activity and is expected to hatch on Easter Sunday. The newly hatched chick weighs 2.1 oz. Humboldt penguin chicks hatch with grayish brown, downy feathers, which molt into completely gray feathers when they fledge. It will be early summer before any of the chicks emerge from the nesting burrows and venture outdoors into the public exhibit for visitors to enjoy. Over the last few weeks, three pairs of Humboldt penguins have been sitting on two eggs each in the burrows specially constructed for the birds in their new exhibit. At least two of the remaining four eggs are fertile. Staff plans to candle the eggs every two weeks to determine if they are fertile, alive and developing properly. 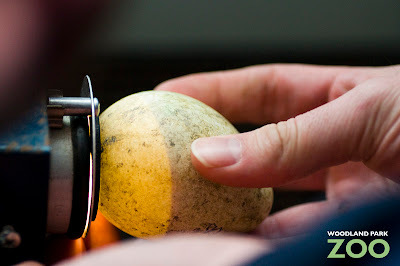 The process of candling involves holding an egg to a high powered and focused light for just a few seconds. The incubation period is approximately 40 days. The eggs, six total in three nests, mark the first breeding and nesting season for the colony of 18 penguins since the exhibit opened last May. 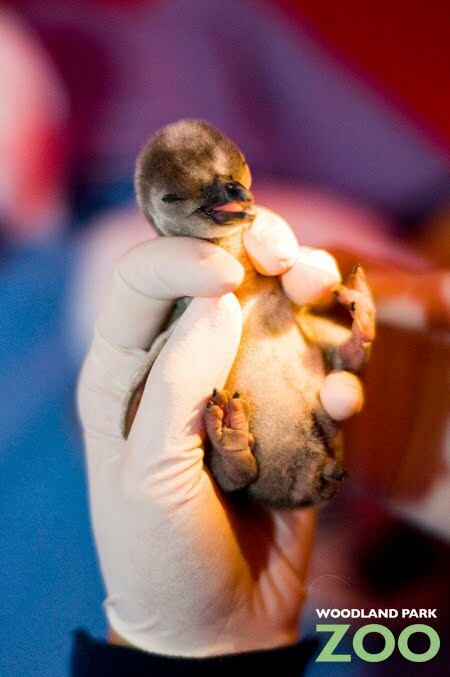 According to Mark Myers, Woodland Park Zoo's bird curator, this hatching is significant for the penguin Species Survival Plan. 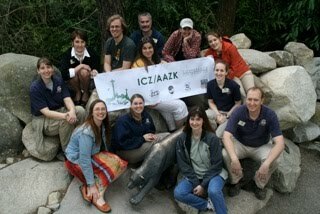 Species Survival Plans are cooperative breeding programs that work to ensure genetic diversity and demographic stability in North American zoos and aquariums. Myers is cautiously optimistic that the chicks will thrive under the care of their parents. As part of the animal care protocols for penguin chicks, staff will attempt to weigh the hatchlings daily for the first five days or so. Myers tells us that as long as the chicks are achieving acceptable weight gains, they will remain under the care of their parents. It’s our goal to minimize staff intervention and allow the parents to raise their chicks and gain experience as parents. If necessary, keepers might offer supplemental feedings to chicks that fall behind the weight curve or if there is a large age difference between siblings.